StoneGable is a place where you can get a really good cup of joe! 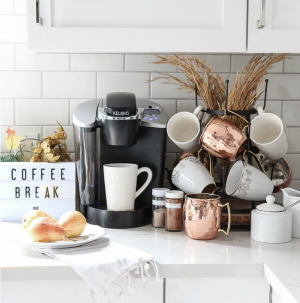 We are huge coffee drinkers and a coffee bar is a must in our kitchen. 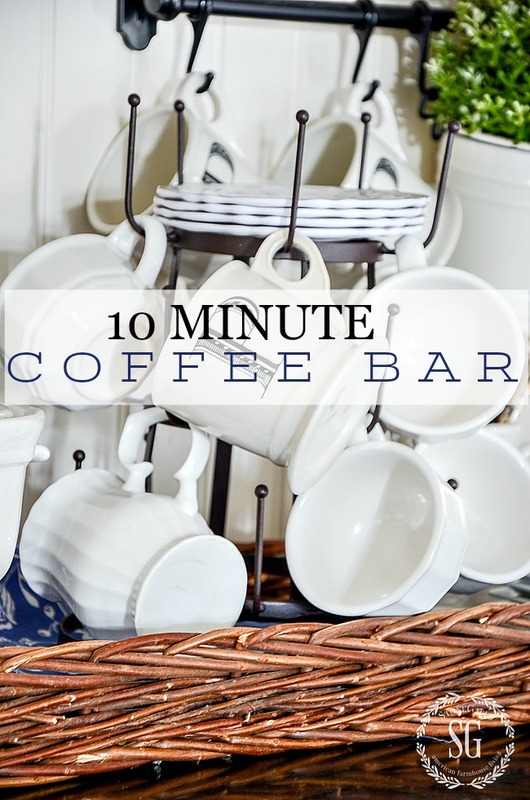 Today I’ll show you how to put a coffee bar together so you will be drinking coffee in just about 10 minutes! I used things that I had in my basement and that took a little while to find but getting all the coffee drinking elements together was easy! Let’s create a coffee bar! Today on the podcast we are talking about HIGH TECH HOME! You won’t believe all the goodies for our homes that are on the horizon or almost here! I loved this episode! A coffee bar is a fixture on one of my kitchen counters. I’m changing things up and creating a new one for the fall! You can make one too. Even if you have just a little room! I chose a long rectangle basket to hold my coffee bar. 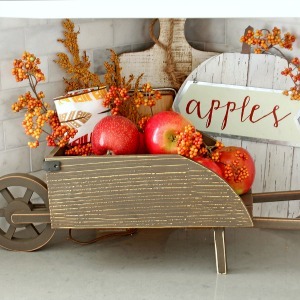 I love the texture of the basket for fall! When all the things you need are in one convenient place you might be apt to drink more yummy coffee! The coffee maker is to the left of the coffee bar! PUT YOUR COFFEE PODS INTO SOMETHING FUN! We have a Keurig and lots of assorted coffee pods. I’ve had them in galvanized canisters for awhile but now I’m using an ironstone soup tureen. How pretty is that? And it holds lots of those little coffee pods! Keep your pods or coffee beans in a pretty container. Why keep your mugs and cups and saucers away in a cupboard? I use a low bottle dryer and hang our mugs and a few cups on it ready to use! The top of the bottle dryer holds the cup’s saucers. And make sure you have a little space for some fresh flowers. 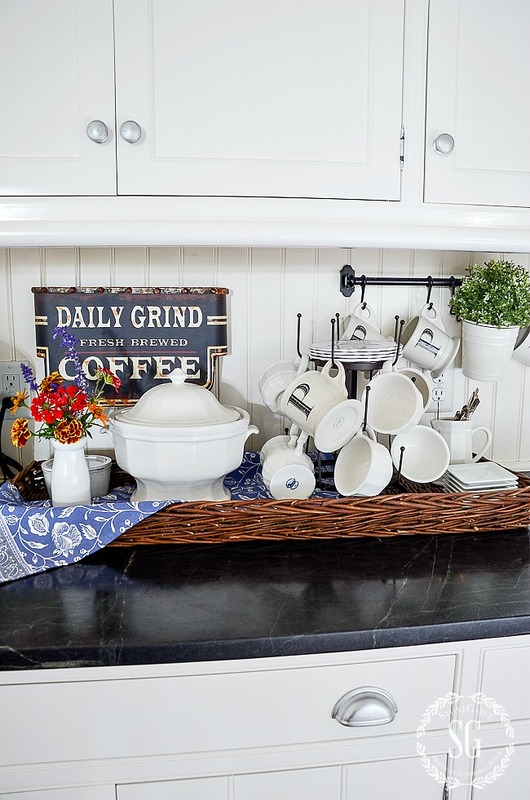 Clean off your countertop and make room for a kitchen coffee bar! 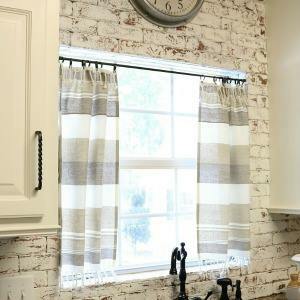 Here are more 10-minute decorating ideas in the kitchen! 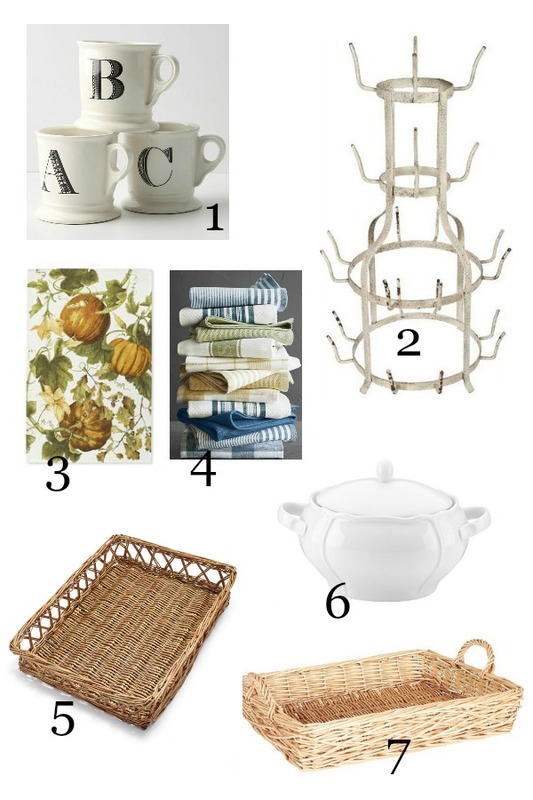 There are so so many great fall ideas for you! Love this. 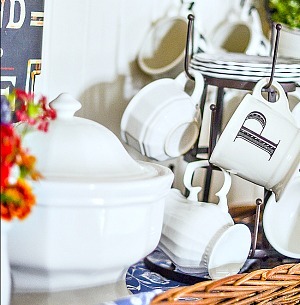 Would you please tell me the brand/style of the white fluted mugs and where you found them? Hi Jennifer, I don’t have them anymore so I can’t tell you. So sorry! I have a cabinet coffee bar. Just might try the whole tray thing.? Love the coffee bar. Functional AND decorative–can change out easily seasonally. Simple, functional, and well thought out – made beautiful by you! Have blessed day. Where could I find the wall rack for your mugs? Absolutely love your coffee bar, who knows I may start drinking coffee. ? 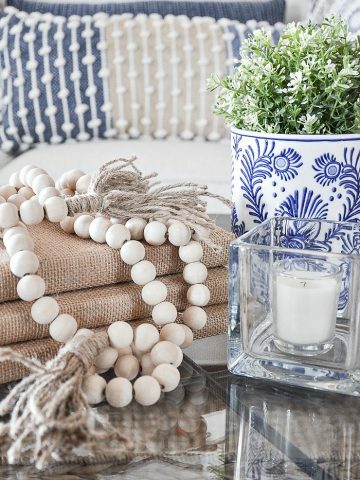 Check Wayfair and Decor Steals. Wondering where you found your mug wall rack? I simply love it and can’t find one similar. I’m so inspired by your coffee bar, I might actually start drinking coffee. I found it on Decor Steals. A true story: We are coffee drinkers and have admired your coffee bar until green with envy! Our neighbor (over the fence) stated ” I’m throwing away an old junky cabinet do you want it? Being in the middle of a Hugh refinishing project I’m saying NO to myself but to be neighbor-ly I agreed to take a look (I so needed a break) so I did. It was a very old cabinet minus the shelving but, in ok condition. Then she lifted the the top and that’s when my ♥️ almost stopped. The stately old piece was an old Victrola cabinet ( decal still attached) Viola, my coffee bar! Unfortunately, It will be stored until spring. Pinning this post. I have that same tureen! $7.50 at the Salvation Army! Steal deal! Love your coffee bar. I change out the strring spoon holder each season. Thanks for sharing!!! Ahhhhh, I’ve always wanted a coffee bar! How perfect Yvonne! 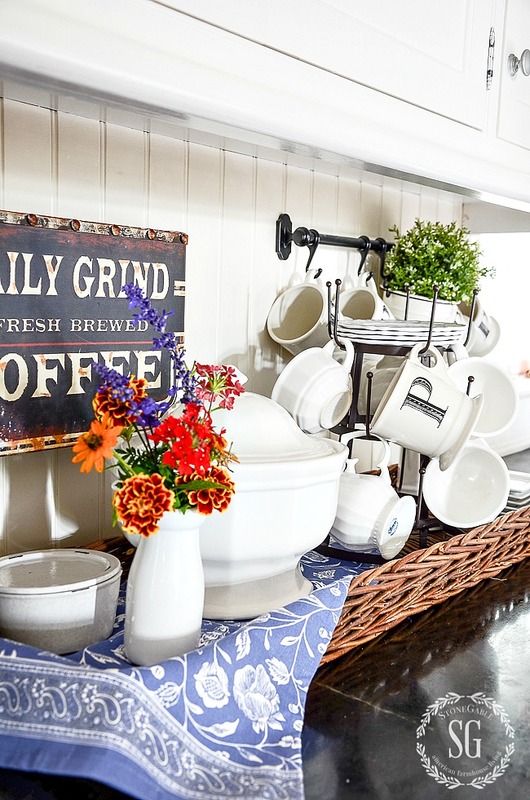 Love your coffee bar, Yvonne! We have one in our kitchen, too, and it is so nice to have as guests can just help themselves! Love your posts! Have a great day! Blessings! I love your kitchen, Yvonne. infact I have used it as a bit of inspiration for my gradual kitchen re model. I love the black countertops and white cupboards. I love your coffee bar and your mugs. Coffee makes me happy… no… human haha. I love your posts, but there are just so many ads now. ? Love the bottle drying rack! lovely, But want to see it from across the room also ! Cute idea, Yvonne, I like it! What a lovely tray of coffeeness. Great ideas and I will be looking for a drying/mug rack similar to your black one. It seems like a perfect size. Hi Yvonne! I want all of you to know I have listened to all 95 episodes of DT&T and love them all! I have tried many times to rate & review without progress. Please tell me how to go about it. I appreciate all your so wonderfully put together newsletters also! Your home is beautiful and so are you!? I’m loving your new coffee bar. 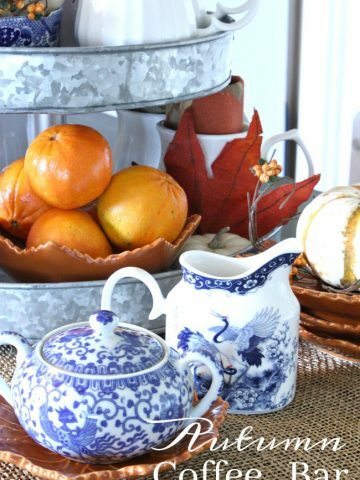 What a great idea to use a soup tureen, I had a set of stoneware in buttercup and over the years the pieces have chipped or broke but I stored away the soup tureen and truthfully forgot about it. So, you have given me a great idea, I’m going to get it out and start using it more often. 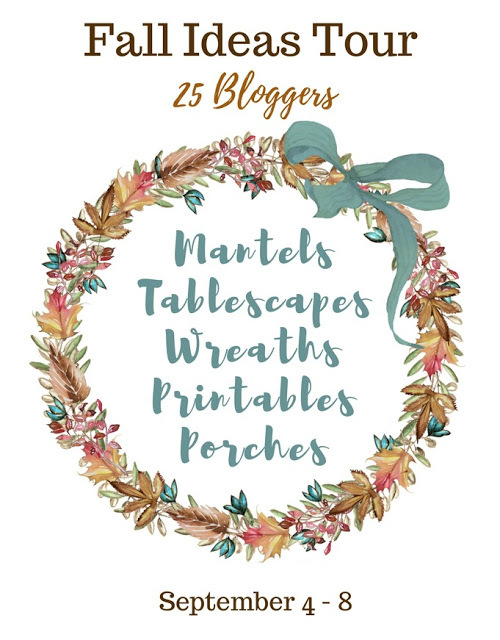 Love your blog today, your cup towel is so pretty, I too love cloth napkins and towels. Where did you get your French bottle drying rack? I have never seen anything like it! I love the idea! I got it locally at a small shop. I love your coffee bar! What a great idea for storing the coffee pods! I love this coffee bar! I’m going to start collecting more WHITE…very pretty. Hi Yvonne, I love the idea of using the tureen to hold pods. Ingenious! Thanks for your tips. like the Keurig to fit on the tray too. Hi Yvonne, It looks like you forgot to give us the link for the soup tureen in the Get the Look section. Cute post. Thanks! Thanks, Marilyn. I’ll fix that! I recently bought an ironstone soup terrine and wasn’t sure how I was going to use it. Putting coffee pods in it is such a great idea. Now I just need to clear a space on my counter. I love your low drying rack. I only seem to find drying racks that are too tall or take up too much space. Going to be setting up a coffee bar using all my white ironstone — and will be using a sweet little covered veggie bowl for the pods. Great inspiration! Coffee is one of my good friends, so I like showing it off! Your station is very attractive…I had a vintage Maxwell House coffee tin and I gave it to a friend, whose last name Is Maxwell. Now I wish I had it…She can enjoy a cute station, I suppose. Changing out my coffee pods right now. 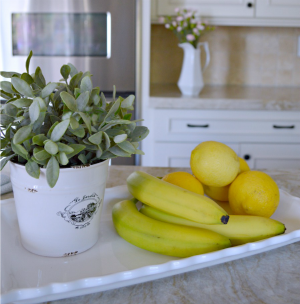 Love the pretty container idea, instead of that ugly thing under my coffee pot! Love the bottle holder as a cup rack! I was born in October–maybe that’s why I love fall colors! And I adore sweaters! Keep those beautiful inspirations coming. 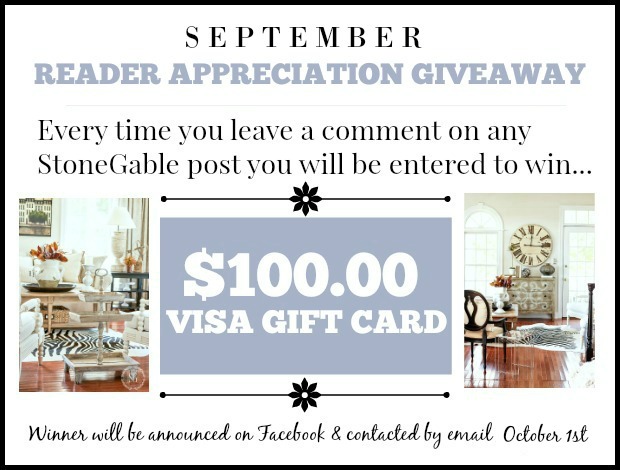 It’s like sitting down in the recliner with your favorite magazine & a cup of joe or cherry hot chocolate when Stone Gable hits my inbox. I’m in heaven! You are so sweet Angela. Cherry Hot Chocolate. I just may show up at your door for a mug and a little chat! 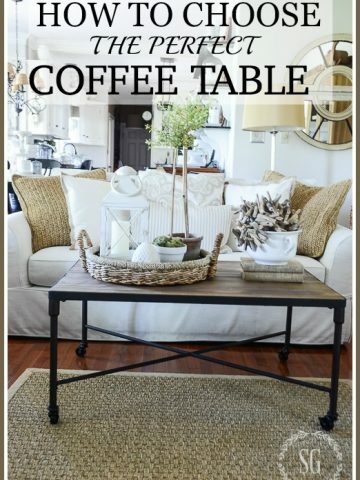 This makes me want to redo my coffee & tea area! I now have a vintage glass canister housing tea bags and antique sugar bowl & creamer filled with spoons all sitting on a vintage cake pedestal. The coffee & mugs are in a cabinet above the coffee maker. With a little rummaging in my basement, I could have them both together in one place. Thanks for the inspiration! We are coffee lover soulmates Yvonne. 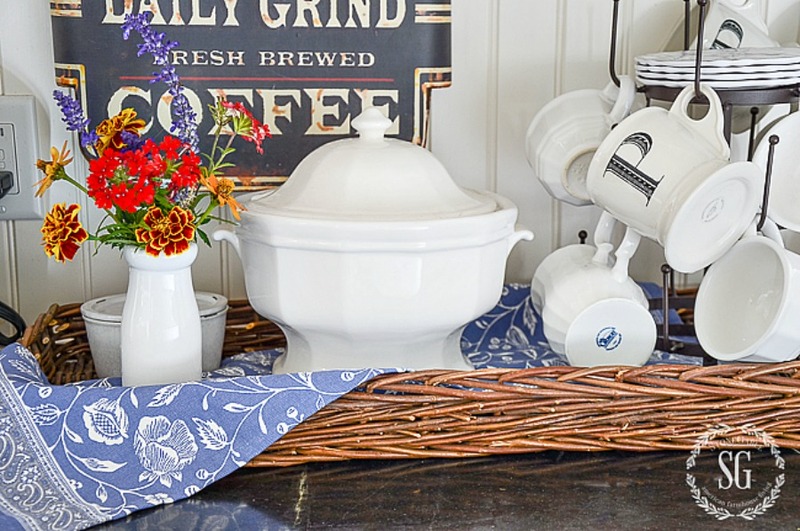 Your tureen is a great idea for pods. I love my coffee bar and add things as I go. I have a couple signs that I like including a coffee one and one of the South. We winter there and it always brings back memories when I read it. I can always use new ideas. 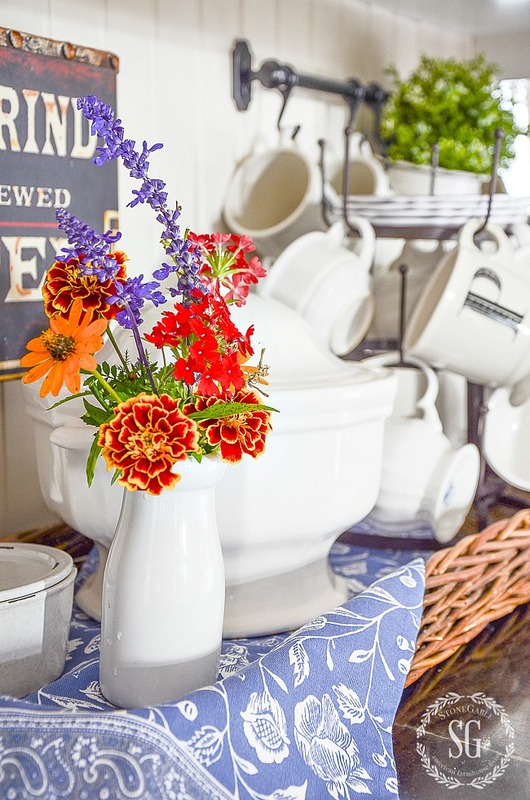 Like your idea of the towel across the basket and adding the flowers too….nice touch! I love this and have been thinking about getting a rack to hang my mugs on. I love coffee mugs! ,thanks for sharing. Beautiful! Love the French drying rack!! We are big coffee drinkers too so this is right up my alley! Love it! Just perfectly beautiful!!! 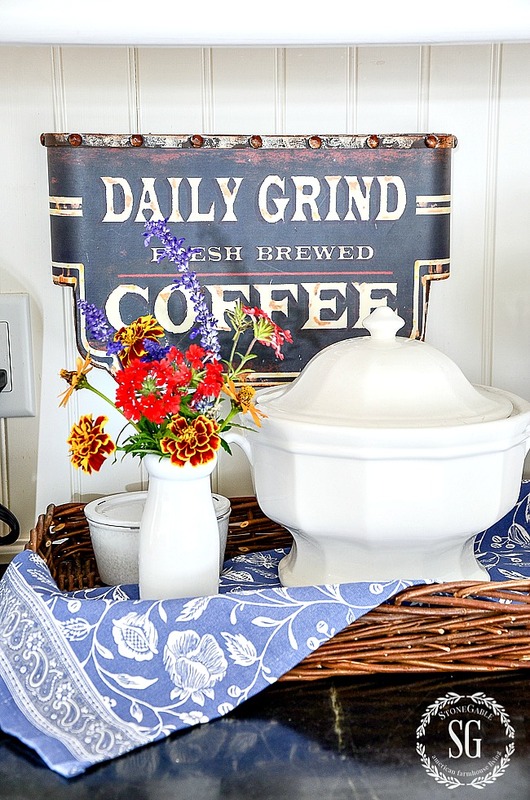 I adore all of it, but am especially smitten with your Daily Grind coffee sign!!! Would you mind sharing where you found such a treasure? Love your blog and all that you teach us!! Looks cute in your kitchen but I like to keep everything tucked away in my cubbard. From one coffee lover to another, all I have to say is this is a super cute and functional coffee bar!! Your coffee bar is lovely. I love my Keurig for hot chocolate and tea, but I haven’t found a coffee pod yet where I like the taste. I make a hot drink bar for winter and a wine bar for summer. I love your coffee bar, but a question I have is …. I think you have soapstone counters, what did you use to bet them so shiny… I love my soapstone and sometimes think about putting something on them to shine them up…..
Hi Kandy, I use a little mineral oil on a cloth and rub my soapstone about once a week. It does not penetrate but gives it a nice glow. Love it! 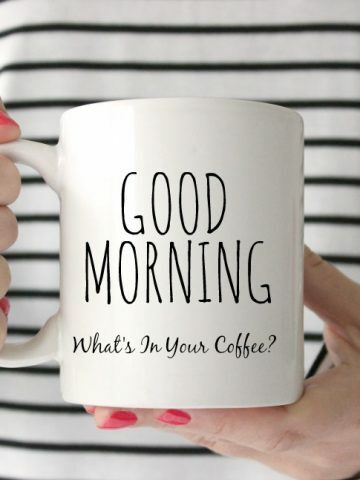 I love my coffee, and it’s a must have every single morning. I also have a Keurig (I’ve had a few for about ten years and love them) and I also have a bottle dryer I bought at World Market that looks like yours. I hang my mugs on them and it looks so cute! I have a lot of the same elements you’re using here, but didn’t think to put everything in a basket tray. I have the perfect one, so I’m definitely going to copy this look! 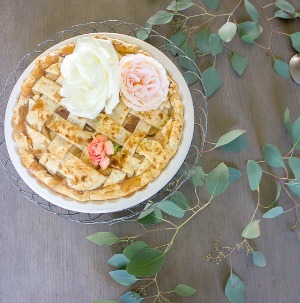 I love the addition of some flowers, and cute napkins. So pretty! I really like these pretty ideas for a coffee bar! Your coffee bar is perfect! The simplicity and beauty of it is awesome! I have my mugs on a bottle dryer also but must find a way to create the “bar” idea cause I love it! Love it! The tureen is a nice idea, better than seeing all the pod labels.